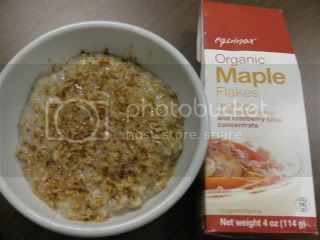 I heart Organic Maple Flakes!!! Happy Thursday all! I LOVE Thursday because it’s almost Friday AND it’s Farmer’s Market day! I have the rough job tonight of heading out to our local Farmer’s Market to bring in fruit for everyone to enjoy at work tomorrow for Farmer’s Market Fridays. 😀 The Husband teased me saying good excuse, good excuse 😀 LOL. I actually popped right out of bed this morning and ready to hop on the treadmill ~ mentally that is. 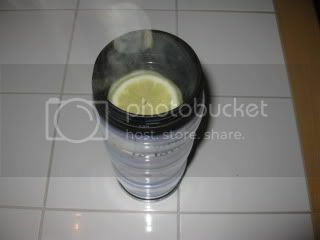 Then, I took my first step and felt like an old lady with soreness and my hip is hurting again *sigh* It didn’t stop me though ~ I slammed out a 60 minute session and got my day started with a Morning Burst togo (hot water plus lemon slices). 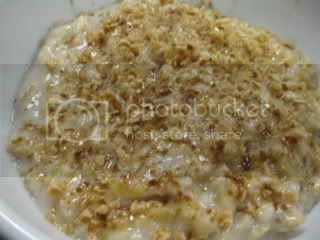 I was definitely ready for breakfast this morning and whipped up a quick bowl of Maple Oats. I want to introduce you all to one of my absolute FAVORITE items of all time ~ as in I buy it in bulk on Amazon.com! All whipped up in the microwave for 3 minutes. Maple flakes are one of my favorite things because they are another healthy all natural sweetener and they have an amazing flavor for less calories! Just check out the stats. They gave my oatmeal a fantastic maple taste for only 30 calories. Equinox Organic Maple Flakes and Sweet Cactus Agave Nectar are my two stand by sweeteners of choice. I even use them to bake with and the maple flakes are fantastic in pancakes and waffles! Here is a closer look ~ check out the BIG flakes of maple goodness. I was soooo pumped yesterday when I realized after Angelea told me that we hit the double digits in the Bikini Bootcamp Challenge ~ Day 10!!!! Woohooo! I am STILL enjoying the challenge and am pondering the idea of continuing it with modifications through my Vegas Vacation! * Get 25% off your entire Border’s Books order through June 14th. Click HERE to print your coupon. * Can you have too much of a good thing? Check out Diet Detective’s Daily tip for an example of when healthy foods go unhealthy. Click HERE. * National YOGA Month begins June 15th. You can score ONE WEEK OF FREE Yoga at several participating studios nationwide. Click HERE to check out all the details & print out your Yoga Month Card. * Then, one last fun thing ~ check out Food For Fitness by clicking HERE! Be sure to check out the Shop 4 A Cause Charity Auction going on today over at Oh She Glows! Have a Terrfic Thursday all! See you all later today or tonight. « I can’t wait to be a "sampler" and I won some Sonny Joe’s! I've never tried maple flakes but they sound like a lovely addition!! Woohoo for Farmer's Markets! 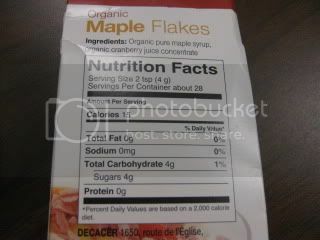 maple flakes?! i'm intrigued.. where did you find those babies?! Wow those sound delicious! I've never seen maple flakes before. I really want to try them! I hope your hip is okay! 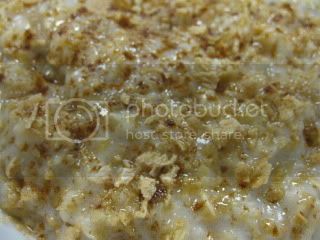 i have never seen maple flakes – they sound awesome! i like maple i like flakes, i think that i would like these! Those maple flakes look delicious! Great job on the treadmill this a.m.! Way to get a great workout in this morning. I can't wait to drag my mom to the farmer's market when I go home! I love getting fresh produce right from local growers. I have never seen that product, but it looks awesome! WTG on your workout! I love the Farmer's Market and look forward to hearing about your finds! K ~ The maple flakes would be fantastic in one of your parfaits! Jenny ~ They are actually only sold in stores in Canada so I ordered my first batch online from here http://www.igourmet.com/shoppe/prodview.aspx?prod=7278 (they have bagged type for cheaper but I like the grinder) about a year ago. I LOVED them so much that I ordered them on amazon in bulk next time and am working on my 5 boxes still. Brandi ~ They are awesome. I had to order them online – see my comment above. Janetha ~ you are so funny with your poem! You'd love these. Chow & Chatter ~ Thanks so much for the compliments! RunToFinish ~ These are such a fun alternative to agave….I LOVE both! Marisa ~ Thanks, it was tough to hang out on the treadmill that long, but, I stuck it out b/c I knew I'd feel awesome after for it. Emily ~ I can't wait to see what you and your mom come up with at the market. But, even more so, how you all use it. I am STILL thinking about that blueberry cheesecake oatmeal! C.G ~ Thanks – Me too! I am sadly addicted to Farmer's Markets but that is a good thing to be addicted too, right?